Join the Fortune 500 and Small Businesses that have already partnered with MeasuredUp to help their customers. 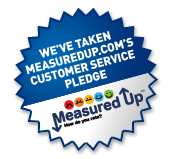 Leading companies demonstrate their commitment to improving Customer Service and making customers happy by posting the MeasuredUp Pledge Icon on their site. CUT AND PASTE THE FREE MEASUREDUP PLEDGE ICON CODE ON YOUR BUSINESS WEBSITE AND SHOW YOUR CUSTOMERS YOU CARE ABOUT AND PROMOTE CUSTOMER SERVICE. It is free to companies and makes a powerful statement that says you care about and put customers first. Customer Service is more important then ever in building your brand. Show your consumers you care about them, are not afraid to put your brand where your mouth is and are committed to improving your Customer Service. We want them to be happy and understand that without them we are not in business. We know we cannot always be perfect and that some consumers will sometimes be angry with us but we are committed to improving our Customer Service and making sure our employees always respect the customer. In this way we will increase brand loyalty, word of mouth and repeat business. The MeasuredUp.com Icon on our website shows our support of the customer and commitment to the Customer Service Pledge to focus on making the consumer happy and to improving our customer service.